Billy is just about to begin playing the classic role-playing game EarthBound! His first order of business will be to enter a name for his character. 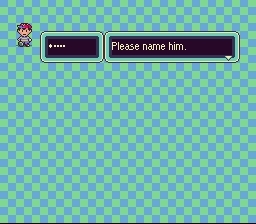 EarthBound's name entry system displays the uppercase letters "A" through "Z" in a row, with a cursor indicating the one currently selected (initially "A"). It also displays the name which the player has entered so far (initially an empty string). Given any name, there are multiple possible sequences of button presses which would end up submitting it. However, as the king of video games, Billy will showcase his skills right off the bat by entering his name of choice using the minimum possible number of button presses. Billy has decided that his name will consist of exactly N (1 ≤ N ≤ 100) letters. To make things particularly interesting, he's also decided to choose a name such that the minimum number of button presses required to enter it is exactly K (1 ≤ K ≤ 10,000). Help Billy come up with any name satisfying both of the above criteria, or determine that no such name exists! The first and only line of input consists of two space-separated integers, N and K.
Output a single string, either a valid name consisting of N uppercase letters, or "Impossible" if no such name exists. In the first case, "CB" meets both criteria: it consists of 2 letters, and requires a minimum of exactly 6 button presses to enter (">", ">", "A", "<", "A", "+"). Note that other outputs would also be accepted. In the second case, there exists no single-letter name whose minimum number of required button presses is exactly 20. May you tell me if it's my output section that's wrong, or if it's my conditions? I think I've got the logic right, but I'm pretty sure the way I output my letters is wrong. Can someone help? I think I've got the logic right, but I'm pretty sure the way I output my letters is wrong. Can someone help? In your latest submission, your output format is correct, and you did get AC on some cases (but your answers are incorrect on the others).